With today’s post, one of MDK’s behind-the-scenes stalwarts steps onto the front page. While Cristina Shiffman’s role today is primarily (and most visibly) as MDK’s social media manager, she has been inspiring, edifying, and entertaining us since the early days of the blog. 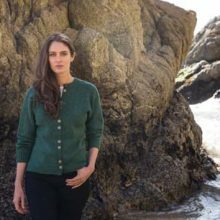 As a longtime natural dyer, Cristina was the exact right person to take a first look at this exciting new reference for the natural dyer. In the Spring, this middle-aged woman’s fancy lightly turns to thoughts of natural dyeing. 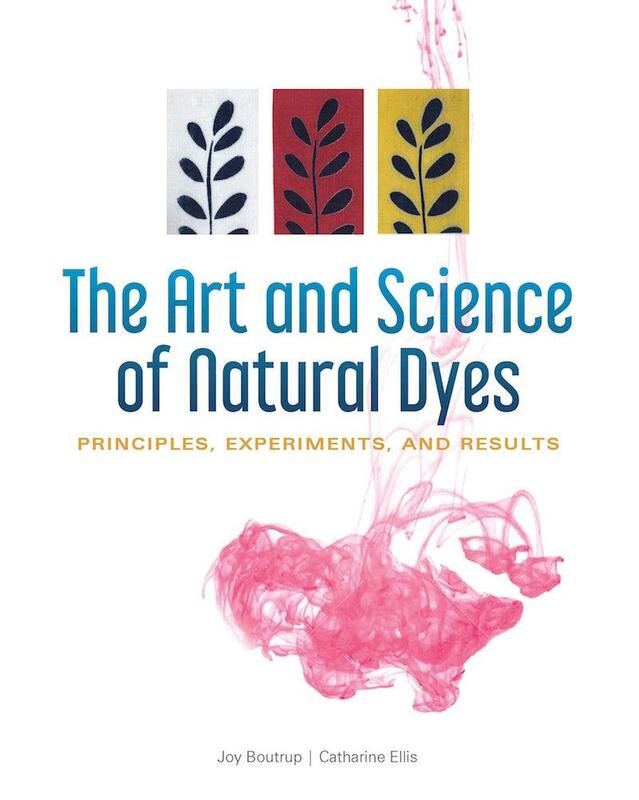 And so it is with great delight that I have been poring over my hot-off-the-presses copy of The Art and Science of Natural Dyes: Principles, Experiments, and Results by Joy Boutrup and Catharine Ellis. This helpfully wire-bound book, with its sturdy hard cover and glossy pages, will get splattered alongside pots of steaming madder and a blooming indigo vat this summer. For now, I’m studying it for the authors’ insight and generous instruction. 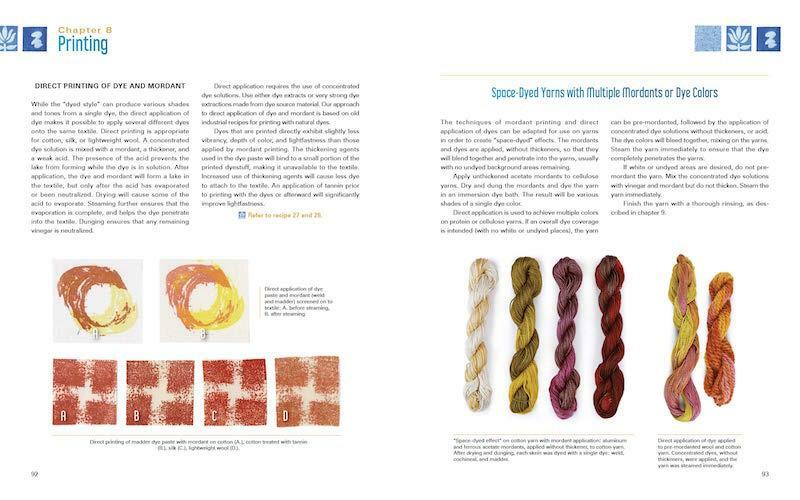 The authors are Joy Boutrup, who brings her background in textile engineering, chemistry, and history to the book’s recipes and techniques, and textile artist Catharine Ellis, whose experience using natural dyes for over ten years shines in the book’s clear explication of methods. The Art and Science of Natural Dyes will find a place in the libraries of textile art departments all over the world, but it’s not at all intimidating for the devoted amateur. The book begins with an overview of animal and plant fibers and how to prepare them for the dye bath or vat. The next chapter takes a close look at the sources of “strong and reasonably permanent” dyes in the natural world. At this point, everyone who has been collecting avocado pits (including me) will want to get out a compost bucket, because “edible plants do not contain dyes suitable for textiles.” That (fugitive) pink! Worry not, a full range of every color can be drawn out of the plants and mordants Joy and Catharine present. 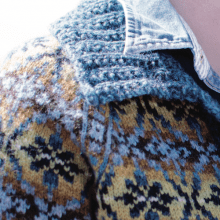 The book contains photos of a full spectrum of samples along with charts and step-by-step photos illustrating the effects dyers can expect to see as they work. I have an ample collection of natural dyeing books. If I had to pick only one to keep, The Art and Science of Natural Dyes would be it. Last June I was among the MDK Knitting Getaway participants who experimented along with Catharine Ellis and her assistant Amy Higgins Stambaugh during bite-sized workshops on natural dyes. 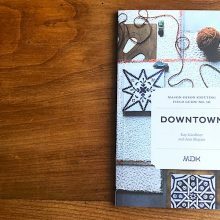 This book contains the feast, including not only immersion dyeing of fabric and yarn, but recycling a dye bath, space-dyeing yarns, direct printing on fabric, and caring for naturally dyed textiles and yarns. I know how I’ll be spending my summer vacation! 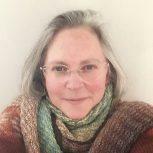 An artist in multiple media by nature and by education, former Waldorf teacher Cristina Shiffman is a knitter, sewist, potter, and photographer who also draws, paints, and dyes with natural materials. Now working as an editor of academic writing, Cristina has been collaborating with MDK since 2017, chiefly as social media eminence. 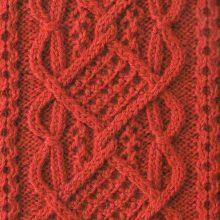 Books and knitters are like peas and carrots. Thank you Cristina, for taking time to digest the book. I loved dyeing with the knitters at Shakerag last summer. Now, about the avocado pits – they do contain a tannin, and thus the light pink color. It’s actually not a bad source of tannin. But the pits are not the edible part….the edible fruit is not a source of dye color. It’s like the hulls for black walnuts – they are not the edible part but are excellent for dyeing. Good that we don’t have to be conflicted about what to use for food and what to save for dyeing! I have that book from a class I took at Maryville College in the 70’s. We dyed wool for knitting and weaving. This past year I used the avocado pits to dye fabric (tee shirts) for a project from Alabama Chanin. I have a jar of rusty nails on my back porch waiting for the dye pot. So much fun! Rebecca Desnos dyes with avocado pits and skins all the time with amazing results! Oh I’m was so excited to read this! I can’t wait to get my hands on my own copy!! I am so happy to see Cristina as an MDK contributor here! She is an excellent social media manager.maven. I sat in on a talk with Catherine Ellis a few years ago and have saying ever since that I wish she would write a book. This is the best news ever for plant based dyers! Christina, it’s so good to hear from you. This book just moved up to the top of my list. Thanks for stepping out of the curtain! *out from behind the curtain! so interesting! I’ve been addicted to hand-dyed yarns for the last few years (what knitter hasn’t been?) and I have been thinking about trying some natural dyeing myself this summer. This book sounds like it is a rich resource on the topic – thank you! This looks fascinating! Thanks for the review! I just sent a purchase request to my local library, as this sounds like something that should be generally available. I have dyed wool with acid dyes, but am very interested in expanding my knowledge of natural dyestuffs! I’m a keen natural dyer, using local plants, and get nice results from edibles, beets, turmeric, spinach etc. So I must follow up on the idea that they’re not suitable. Perhaps they had fugitive issues in mind. 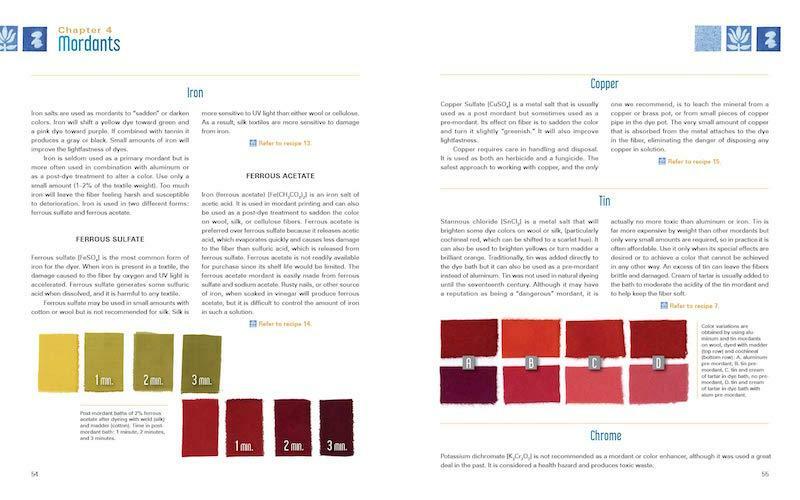 Any new book on dyeing is worth checking out, thank you. After participating in several workshops on natural dyes – including the one with Catherine and Amy at the Knitting Getaway, I have started trying a few things with natural dyes. This book with its detailed explanations and recipes has been so helpful. It’s the next best thing to having a knowledgeable teacher by my side! I am planning many more projects.